The National Main Street Center (NMSC) and Project for Public Spaces (PPS) have partnered to integrate and scale Placemaking as a key approach to community revitalization across America. In spring 2016, NMSC and PPS presented a series of two-day Placemaking trainings in five states. 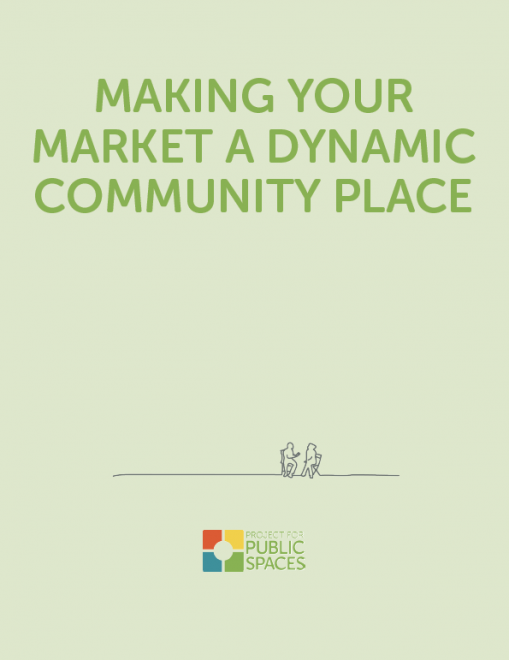 As part of this program, PPS developed a guide on how to plan a community-oriented market that can also become an important economic driver. This guide serves as an introduction to some of the key principles of developing and managing a successful market including site selection, marketing and promotion, partnership building, vendor and product mixes, and programming. Also included are sample market layout plans and brief case studies of markets in the United States that have become central destinations in their communities. Written by Project for Public Spaces, with generous support from Anne T. and Robert M. Bass.